Choose from a variety of great locations throughout the state, where you can enjoy jet skiing in New York. Find all types of places that offer jetskiing in NY, including places to take kids jetskiing in New York. East Coast Parasail is known for offering exhilarating parasailing. Did you know that they also offer jet skiing? When planning your summer vacation down the Jersey Shore, East Coast Parasail will give you an exciting experience. Start your adventure at Utsch's Marina in Cape May, NJ. Before you begin, you will be given a safety briefing and instructions by a USCG licensed captain. East Coast Parasail has a 100% safety rating, and has been named a watercraft rental service "model of compliance" by the NJ State Police. You will be guided to a designated area that is safe to ride in. Then, let the adventure begin! Experience the thrill of zooming through the water on a high-speed waverunner. Please note that East Coast Parasail only rents jet skis to individuals 18 or older, and minors must be accompanied by a parent or guardian. Passengers must also be 44 inches tall. 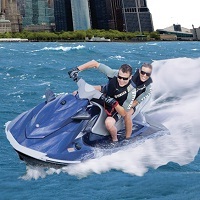 Fun Jet Ski Tours in NY! If you have a love of jet skiing, Jetty Jumpers offers fun-filled jet ski tours of beautiful New York City! Feel the beat of NY as you explore its waterways and take in the wondrous sights along the way. Each NYC tour begins in Sheepshead Bay, Brooklyn. During your journey you will pass through Manhattan, as well as the Brighton and Coney Island beaches. Keep the camera handy as you pass such attractions as the Statue of Liberty, Ellis Island, Battery Park, Governor's Island, South Street Seaport, and the Brooklyn and Manhattan Bridges. All guests will receive brief safety classes before each ride. 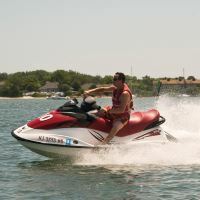 All jet skis have a three-person capacity and can be rented hourly. Reserve your jet skis/tours today by calling 917-734-9919! The Rockaway Beach, the largest urban beach in the United States, is located on beautiful Jamaica Bay. In the NY neighborhood you will find a lot of fun and experience some of the most beautiful sunsets NYC has to offer. Rockaway Jet Ski’s fleet has brand new 2012 Yamaha VX Cruisers which make it possible for you to enjoy one of the best jet skiing in New York. Bring your camera and take marvelous photographs of the Statue of Liberty or Manhattan’s skyscrapers. You can dry-off at the Thai Rock Deck and Bar and stick around for the finest live entertainment New York has to offer. Working hours: every day from 11am-7pm (weather permitting).